Clams were an important resource to the Downeast region’s native peoples, whose preference for shellfish is evidenced by the numerous shell heaps, or middens, scattered along the coast, including at Clark’s Point on Machias Bay and around Passamaquoddy and Cobscook bays. These ancient shell piles also provide a record of resource use and abundance over time. The shell mounds contain layers of information, like rings on a tree, that reveal something about Native American diet, migration, and tools used to harvest and process food. Shell midden archaeology suggests that clams became prevalent in the Passamaquoddy diet about 3,000 years ago, when people shifted toward more coastal living (Sanger 1971). These early residents likely roasted the clams over fires, perhaps wrapped in eelgrass (Baird 1882, Sanger 1971). Other important shellfish-gathering locations include Frenchman Bay and Bar Harbor, the Wabanaki name for which means “clam-gathering place.” European settlers found heavy growth of trees on top of shell heaps near Mount Desert Island, suggesting historic use of clams in the region (Williamson 1832). Early native people may have moved to different places to harvest shellfish, and this would have allowed the previously harvested areas to recover. Massachusetts Colonial Ordinance of 1641-1647 established public rights to coastal resources, granting every household “free fishing and fowling as far as the tide doth ebb and flow.” Maine retained this law when it became a state in 1820, granting rights to residents to take clams for personal and family use and to fishermen for bait. Early European settlers harvested clams primarily for subsistence. Colonial accounts even suggest that clams were a “last resort” food option during this period, eaten only when other food was scarce (Dow and Wallace 1961, Stubbs 1982). Clams first found commercial value as bait in connection with other booming fisheries, such as cod and haddock. Inshore fishermen used fresh shucked clams, and barrels of shucked, salted clams provided the primary bait aboard schooners in the offshore salt-cod fishery of the nineteenth century, until around 1875. Clam harvesters or “clammers” dug into mud exposed by low tide with a four-tined short-handled hoe or fork, or else pulled them by hand, and placed them in a basket known as a “hod” or “roller.” Clammers moved along the shoreline, digging wherever clams were abundant and weather, tide, and harvesting restrictions allowed. Family and friends worked together. In the beginning of the industry, clamming was a winter fishery that provided a welcome source of income for those needing employment during the cold months. In the middle and late nineteenth century, the fresh clam industry became important, first during the Civil War in the form of clams shipped to Boston, fried and sent to troops (Wallace 1984). Later, increasing numbers of tourists created a demand for small, steamed clams in the shell, as clambakes and “shore dinners” became popular (Dow and Wallace 1961). Clams and other shellfish continued to have commercial value thanks to technological innovations in preserving that allowed for long-distance transport by boat and rail (Judge 1914). The first clam cannery in the United States was built in 1878 at Pine Point in Scarborough (Stevenson 1899), with the clams marketed as “Scarboro Beach” brand by Burnham & Morrill. Other canneries periodically turned to clams, especially during the winter months when other resources were scarce, in order to maintain year-round operations. In 1880 the William Underwood Company built a canning plant in Jonesport, where sardines, clams, lobsters and other fishery products were canned. Clams also were canned in Brooklin by the Farnsworth Packing Company (“Pennant” brand), by Sullivan & Friend in South Blue Hill beginning in 1898 (later sold as “King of the Coast” brand by Sylvester company), and by the Cousins Cannery in Brooklin. In 1917, Willard M. Look founded the original East Machias Canning Company on a wharf in Whiting, at the head of Holmes Bay; Harnedy and Harnedy suggest this plant was the first to pack steamed clams in the US, and also report that Willard M. Look turned to the Cutler clam flats to supply his cannery. This is now Looks Seafood and is still in operation as a shellfish dealer/processor. Some processors produced extract from soft-shell clams or the juice left over after canning, selling it in pint, quart, and gallon tin cans (Stevenson 1899) or glass bottles (Gould 1997). Clammers often delivered their clams directly to canneries by boat, with dories filled to capacity with one or two clammers’ daily harvest, which was transported to shucking houses adjacent to the canning plants. By the twentieth century, bait and canned clams began to give way to fresh clams, as consumers longed for clam chowder, steamed clams, fried clams, and minced clams. The volume of clams sold in the shell was 25 times greater than the volume sold for bait. This transition was facilitated by refrigeration, the growth of highway systems, and truck transport. The market for canned Maine soft-shell clams also declined because southern canneries began to use “hen” or Atlantic surf clams, although canning remained important in Hancock and Washington counties through the 1960s. The invention of the deep fat “fryolater” in the 1930s increased restaurant demand for fresh clam meats. Most Maine clams went to two markets: the smaller clams were sold as “steamers” and the larger clams shucked for fried clams (Ellis and Waterman 1998). Production of soft-shell clams reached an all-time peak in 1946, when close to ten million pounds were harvested (DMR 1978). Expanded Maine shucking facilities, decreased labor force during the war (and consequent increased clam populations), and then a strong workforce following World War II all were considerable factors in this increase (Dow and Wallace 1961, Nault 2012). Many World War II veterans dug clams until they could find other work, or clammed in spring and summer, then picked blueberries and potatoes, went deer hunting in November, and cut trees in the winter. The rapid increase in harvest can also be seen in legislation reducing the minimum harvest size, and consistently high seasonal prices that encouraged clammers to dig at a larger scale and more continuously year round (Dow and Wallace 1961, Wallace 1984). John Faulkingham of Beals Island remembered digging clams when he was in high school: “I can remember digging one morning, cause’ I lived with my grandmother then and I left when it was just growing daylight, on a low drain tide. I think I dug three bushel that morning and I think I got… I was thinking three dollars a bushel, and away I went to school. I made nine dollars out of the three bushel and I got them down here… Tide was way down, and I saw this place, and I started digging and when you rolled em’ over it was good, good clammin’” (Jonesport-Beals 2003). Clam populations began to decrease drastically in the 1950s, due mostly to a new predator: the green crab, an invasive species from Europe. In addition, pollution from various sources caused more and more flats to be closed to harvesting. The first pollution closure occurred in the 1930s in southern Maine. By 1960, nearly 16 percent of all coastal flats had to be closed due to wastewater pollution; by the late 1970s, pollution closures had expanded to nearly 44,000 acres, or 20 percent, of Maine’s productive clam flats (Dow and Wallace 1961). The 1970s also began a period of increasing outbreaks of “red tide.” These are population explosions of dinoflagellates in the genus Alexandrium. Dinoflagellates are a kind of single-celled phytoplankton that is filtered from the water by shellfish and contains a toxin that accumulates in shellfish tissues and causes paralytic shellfish poisoning when the clams are consumed by humans (either cooked or raw). Chronic outbreaks have continued since 1974, when Maine established a statewide program to monitor shellfish poisoning. Researchers have found the highest concentrations of Alexandrium in waters off the Downeast coast, in the Bay of Fundy, and eastward to Nova Scotia, perhaps related to increased nutrient levels (Townsend 2001). Through the ’60s and ’70s, clam prices continued to increase, attracting large numbers of harvesters. From 1968 to 1973, the number of licenses issued by the state increased from around 2,000 to 6,000. The majority of clams came from Washington and Hancock counties. In 1977 and again in 1982, approximately 250,000 bushels of clams were harvested from the flats in Washington County (DMR landings data). “During this period, harvesters could earn a good living digging clams. A hard-working clammer could enjoy the independence of self-employment and also earn a yearly income equal to that of other fisheries, with much less capital investment. During this period of prosperity, many clammers built houses, bought new vehicles, invested in larger boats to go into other fisheries, or financed education. This boom lasted until the mid 1980s” (Ellis and Waterman 1998). Clam landings drastically declined across the state and especially in Washington County between 1984 and 1989. Clam harvesters and shellfish committees in Downeast towns worked with the Maine Sea Grant Program at the University of Maine to address the declines in clams, surveying flats and studying recruitment of young clams onto flats. The Darling Marine Center began spawning clams and shipping clam “seed” to nursery sites in various coastal towns (Newell and Lignell 1983). In 1987, the communities of Addison, Beals, Jonesport, Jonesboro, Roque Bluffs and Machiasport, along with the University of Maine at Machias, formed a regional shellfish management program. The Beals Island Regional Shellfish Hatchery (today known as the Downeast Institute for Applied Marine Research & Education) began raising three to five million seed clams annually to enhance wild stocks in selected towns in an attempt to provide clammers with a greater source of income. Despite these efforts, clam harvests continued to decline, and by 1997, clam landings in Hancock and Washington counties had dropped from a historic 68 percent of the state total to 26 percent. More than 2,000 jobs were lost. Clamming, and the regulation of the clam harvest, has a strong local tradition in Maine. During the 1800s, the legislature passed private and special laws giving towns the authority to issue licenses, open and close flats, set harvest limits, and restrict harvesting to local residents. In 1894, the new Department of Sea and Shore Fisheries took over enforcement of these laws. Clam flats remained closed to commercial harvest from April to October (a rule in place since 1850; locals were still allowed to dig ‘food for family and self’ and ‘innkeepers for their inns’). “The drain on our clam supply is very large and the demand for the Maine clam still increasing,” wrote Maine’s Commissioner of Sea and Shore Fisheries in 1902. “To conserve and increase the yield is the all important question.” The state began experimenting with aquaculture, transplanting clams on leased areas of depleted tidal flats, and promoting reservations with harvesting restrictions. In 1911, the Maine Legislature passed a law giving towns the right to lease one-quarter of the clam flats within town limits. Few took advantage of the law because tradition was firmly entrenched that clams were common property and the law did not provide for exclusive ownership of the clams and private leases (Beal 1994). In 1941, the New Deal’s National Youth Administration provided personnel and funding to transplant clams in Washington County flats. These changes represented a significant shift in attitude, from trying to stimulate individuals to lease areas and manage clam farms toward community-based management for local production (Newell and Lignell 1983). The state first issued commercial licenses in 1947, to 2,474 harvesters. In 1957, the legislature restricted harvesting to hand implements only (some clammers had been experimenting with dredges and other mechanical means, with minimal success). In the early 1960s, towns were given responsibility by the Maine Legislature to co-manage their clamming resource with the State of Maine through the Department of Sea and Shore Fisheries (now the Department of Marine Resources). Towns elect a stewardship, or shellfish, committee that adopts a state-approved management plan known as a shellfish conservation ordinance. The goal of the ordinance is to “insure the protection and optimum utilization of shellfish resources within the boundary of the town” (Beal, 1994). Clam management remains one of the few co-managed fisheries in the U.S. today. Since 1961, Maine’s public clam flats have been managed jointly by coastal communities and the Department of Marine Resources. Towns can establish shellfish conservation programs, regulate shellfish amounts harvested, provide enforcement, regulate size limits on soft-shell clam, and provide digging licenses. The clam fishery remains the only commercial fishery in Maine that is managed at the community level, with municipalities working in partnership with the state and with clammers. Beal, B.F. 1994. Biotic and abiotic factors influencing growth and survival in wild and cultured individuals of the soft-shell clam, Mya arenaria, L., in eastern Maine. Ph.D. dissertation. Orono, ME: University of Maine. Clancy, M. 1997. “Clam harvest a puzzle: dwindling numbers in Down East a sharp contrast to rebound in southern Maine counties,” Bangor Daily News. Dow, R.L., and Dana E. Wallace. 1961. The Soft-Shell Clam Industry of Maine, Circular 110. Washington, DC: US Fish & Wildlife Service. Gould, J. 1997. The clamor for Maine’s clams. Christian Science Monitor, 17 October. Harnedy, J., and J. Harnedy. 2001. The Machias Bay Region. Charleston, SC: Arcadia Publishing. Jonesport-Beals High School Local Fisheries Knowledge Project, Linda Church and Pam Smith, Project Leaders, 2003-2006. Interviews conducted by students at Jonesport-Beals High School in Jonesport, Maine as part of the NOAA/NMFS Local Fisheries Knowledge Pilot Project. Interviews are accessed on NOAA’s Voices from the Fisheries website, www.voices.nmfs.noaa.gov. Judge, A.I. 1914. A History of the Canning Industry. Baltimore: Canning Trade. Nault, D-M. Interview with R. Crouch, August 2012. Newell, C., and K. Lignell, editors. 1983. Increasing Clam Harvests in Maine: A Practical Guide. 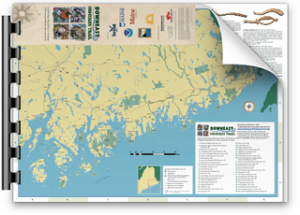 Orono, ME: Maine/New Hampshire Sea Grant College Program. [PDF]. Stubbs, L. 1982. Mya arenaria, the “steamer” clam. Fisheries Education Unit #15. Augusta, ME: Department of Marine Resources. Townsend, D.W., N.R. Pettigrew, and A.C. Thomas. 2001. Offshore blooms of the Red Tide Dinoflagellate, Alexandrium sp., in the Gulf of Maine. Continental Shelf Research 21:347-369. W.D. Williamson. 1832. The History of the State of Maine, Volume 1. Hallowell, ME: Glazier, Masters and Co.